The skin is an organ without any marks on birth. Imagine a piece of silk and that is our skin. Keloid Scars – raised, red scars beyond the original margins of the injury. Contractures – these scars affect the mobility of the area affected. A contracture develops when the normally stretchy skin tissues are replaced by non- stretchy fibre-like tissue. This tissue makes it hard to stretch the area and prevents normal movement. Contractures mostly occur in the skin, the tissues underneath, and the muscles, tendons, ligaments, and joint areas. They affect range of motion and function in a certain body part. Sunken in or Atrophic Scars – theses scars are formed resulting in thinning of the skin and damage to the underlying muscle and collagen fibres. Various creams and ointment can be given that help in flattening or blending in of the scars. Steroid Injections- Steroid injections into a scar may help flatten it. Injections may help to soften the appearance of keloid or hypertrophic scars. RF PIXEL Laser resurfacing. This procedure resurfaces the skin using different types of lasers. 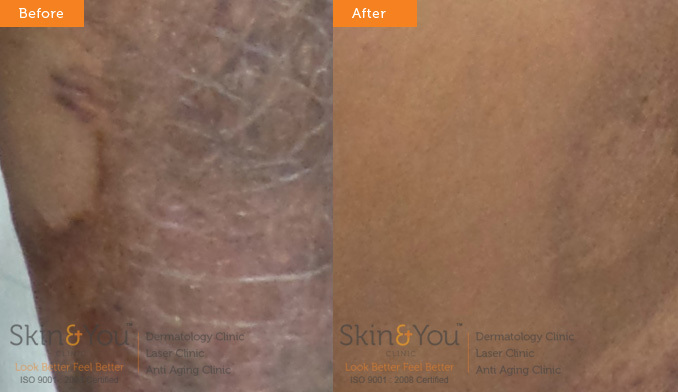 The laser system inch by inch helps in skin resurfacing with minimal or no downtime. It is especially helpful for burn scars. It helps in improving the mobility and decreasing the contractures. With its collagen formation affect it helps to improve the texture and tone of the scar. Filler Injections- These treatments can be used to raise sunken scars to the level of surrounding skin. The effects of these injections are only temporary, however, and the procedures may need to be regularly repeated. But filler injections can show a dramatic result. MCA Scar filling- is an advanced technique use to fill the scar by a micro needling method.It helps in collagen regeneration and lifts the scar. Why skin and you clinic for scar treatment? We at Skin & You Clinic specialise in burn scar treatments. We have a systematic approach to scars and understand that scars have a physical and emotional effect on the patients.